Following World War II, the United States experienced a greatly elevated birth rate, adding on average 4.24 million new babies to the population every year between 1946 and 1964. This generation of “baby boomers” was the result of a strong postwar economy, in which Americans felt confident they would be able to support a larger number of children. Boomers also influenced the economy as a core marketing demographic for products tied to their age group, from toys to records. Constituting as much as 40% of the American population, baby boomers have exerted a strong pull on American culture at large, particularly during the social movements of the 1960s. Today, most boomers are at or near retirement, prompting concerns for how American society will cope with an aging population. Like many industrialized Western nations, in the early twentieth century, the United States was experiencing a gradual decline in its birthrate. As more Americans moved off the farm and into the city, having a large family slowly transformed from a good labor investment to a poor economic choice. Consequently, in the midst of the Great Depression, the American birthrate fell to its lowest point yet, to just 18.4 live births per thousand population. 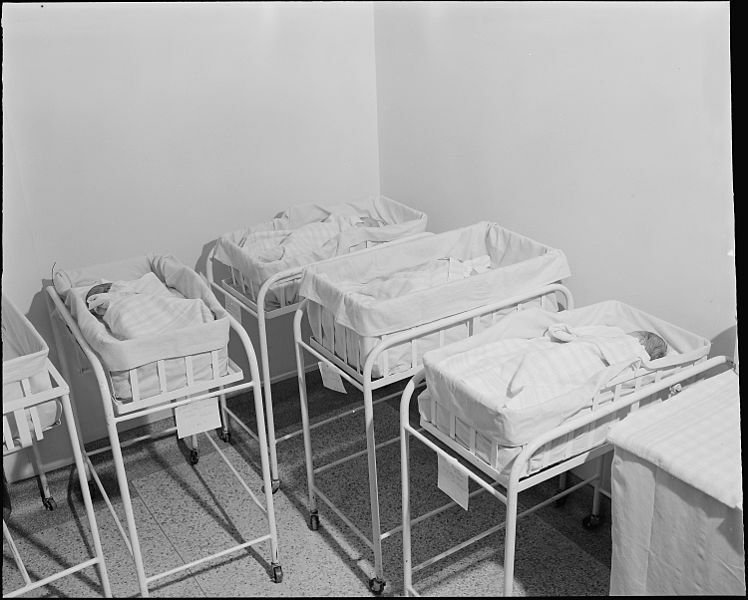 Photograph of a hospital nursery showing five cots where newborns sleep. A hospital nursery full of newborns in the coal mining town of Richlands, Virginia, August 1946. Photograph by Russell Lee, image courtesy National Archives and Records Administration. World War II, however, had a profound effect on the American birth rate, which skyrocketed in a stunning and unexpected reversal of the pre-war decline. A combination of factors produced this baby boom: soldiers returning home from the war were weary of adventure and wished to settle down into family life with their sweethearts, and GI Bill benefits promised the decent pay, access to good jobs, and affordable housing that made raising a family possible. After more than fifteen years of economic uncertainty, things were finally looking up in the United States, and everyone was determined to make the most of it. World War II had vast repercussions not only on world politics but also on the American family. Couples rushed to wed and conceive children before soldiers shipped out–in part due to the romance and urgency of wartime, in part due to the extra pay soldiers received if they had families to support. The spike in marriages was even larger after the war, as returning soldiers tied the knot. 2.2 million couples married in 1946, a new record that would stand until the 1970s. With this record number of unions came a record number of babies. The first stirrings of the baby boom became evident as early as 1942 when the historically low birth rates of the Great Depression began to turn around with the birth of “furlough babies” during World War II. It wasn’t until nine months after the war’s end, however, that the boom began in earnest: before demobilization, only about 200,000 babies were born in the United States per month, but by the end of 1946 that figure had increased to nearly 350,000 babies. 20% more babies were born in 1946 than in 1945. By 1947, the number of live births per thousand population jumped to 26.6. But the baby boom wasn’t just a quick spike in births after the end of World War II. The elevated American fertility rate continued for another 18 years. On average, 4.24 million babies were born per year between 1946 and 1964, when birth rates finally began to decline again. In 1964, the 76.4 million babies born during the baby boom generation constituted a whopping 40% of the US population, which was then about 192 million. Line graph showing US crude birth rates (number of births per thousand population) from 1909 to 2009. The birthrate dropped slowly from 30 births per thousand in 1909 to 18.5 births per thousand in the late 1930s. Starting in 1945 there was a sharp spike in the birth rate again, back up to 26.5 births per thousand. The high birth rate continued until the mid-1960s when the rate finally fell to pre-1945 levels. The birth rate kept falling until the late 1970s when the “baby boom” echo generation made a small increase through the 1990s. The birth rate in 2009 is 14.0 births per thousand, an all-time low. US crude birth rates from 1909 to 2009. The red portion of the line denotes the baby boom generation. The smaller bump between 1976 and 2001 shows the baby boom “echo.” Image courtesy Wikimedia Commons. Why did the birth rate rise so suddenly and remain elevated for so long? Both men and women had access to relatively reliable forms of birth control, so for the most part couples were making a conscious decision to have more children. The World War II generation, in fact, was the most marriage- and family-oriented in US history: 96.4% of women and 94.1% of men in this cohort got married, and at a younger age than their forebears. They also had more children, sooner after marriage and spaced closer together, than earlier generations. Propaganda poster from World War II, painted by Norman Rockwell. The text says OURS . . . to fight for: FREEDOM FROM WANT. 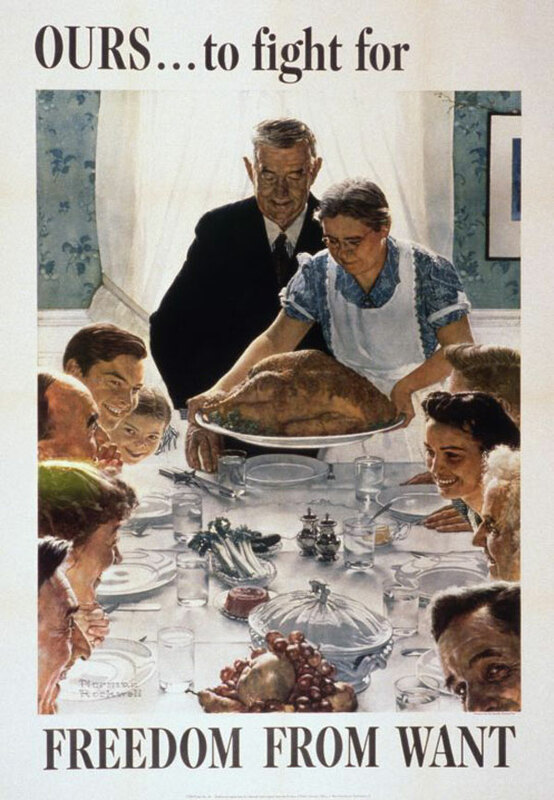 The painting on the poster shows a Thanksgiving dinner table. An elderly white couple places a large turkey on the dinner table and many white family members smile in anticipation of the meal. The painting suggests a happy and united family enjoying a prosperous time. Norman Rockwell, Freedom from Want, 1943. This Office of War Information poster illustrated one of the freedoms the Allies were fighting for during World War II. Images like these may have induced Americans to crave domesticity and family life in the postwar era. Image courtesy National Archives. Historians and demographers have pointed out a number of possible reasons for this increased devotion to domesticity and child-rearing after the war, from government propaganda extolling the virtues of apple-pie American life during the war to a yearning for the security offered by “normal” family life during an era when fear of the atomic bomb pervaded society. One thing is certain: these high fertility rates closely correlate with a period of unprecedented economic prosperity, as well as optimism that the prosperity would last. After years of barely getting by during the Great Depression and enduring shortages and rationing during the war, Americans finally could afford to have a lot of children, so they did. The baby boom was not only a result of the healthy economy but also a major contributor to it. An enormous generation of babies became an enormous generation of children, teenagers, young adults, adults, and (more recently) seniors. As the baby boomers aged, manufacturers and advertisers targeted this gigantic demographic. As babies, the boomers invigorated the market for toys, candy, and washing machines. As children, their proliferation drove the construction of new schools and suburbs. As teenagers, they dominated the popular culture of the 1950s and 1960s, buying clothing and records. As adults, they gave birth to an “echo boom” generation of children, a smaller but still significant generation of kids born between 1976 and 2001. The generation born in the twenty years following World War II has been a defining force in the twentieth and twenty-first centuries. Coming of age in the 1960s and 1970s, they were on the forefront of social change in those decades, including the later stages of the Civil Rights Movement, the protest against the Vietnam War, and the second wave of the feminist movement. It might even be said that those movements gained momentum because of the sheer size of the baby boomer generation, whose shared concerns and life experiences as an age cohort exerted an influence on American culture proportional to their numbers. The unusual size of the baby boomer generation has not had universally positive effects. Like a “pig in a python,” as many demographers have characterized the group, the boomer generation has stretched and transformed American society as its members have moved through life. Today, the baby boomers still number about 76 million, as immigrants of approximately the same age have made up for American-born boomers who emigrated or passed away. As they age, the ratio of retired Americans compared to working Americans will increase significantly, placing considerable strain on Social Security, hospitals, and other government agencies designed to aid the elderly. The Census Bureau estimates that by 2030 one in five Americans will be over the age of 65. Furthermore, as the US birth rate is currently at an all-time low of just 12.5 live births per thousand population, by 2056 Americans aged 65 or older will outnumber those under the age of 18. What effect this aging population will have on US society remains to be seen.